Innovation pedagogy redefines how knowledge is absorbed, produced and used in order to create innovations. 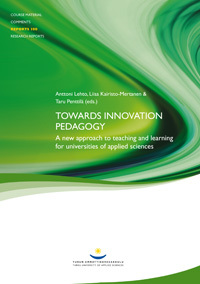 The book contributes to discussions on what innovation pedagogy actually means in the context of universities of applied sciences and aims at having a unifying effect on its conceptualisation. Good practices based on innovation pedagogy and its applications to teaching and learning are presented in the form of case articles from the Faculty of Technology, Environment and Business. It is hoped that the publication inspires discussion and generates research for developing innovation pedagogy further. The texts are primarily targeted at the staff members of universities of applied sciences as well as all the planners, developers and decision-makers partaking in activities relating to higher educational institutions.